RS Agrimix EVO14 single auger mixer with front conveyor and side elevator. 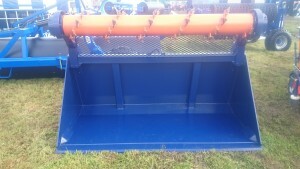 RS Agrimix EVO21 twin auger mixer with front conveyor and side elevator. The mixer was on a single commercial axle with 406×120 brake and 435/50-19.5 wheels. Hi-power magnets were fitted at the customer’s request. This machine was delivered the following day to a farm in Dorset, replacing an RMH WAV20 which was previously supplied by RS Agri. RS Rapide Brush cubicle sweeper with Honda petrol engine and 700mm brush. RS ride-on sweeper. This was the first chance to see the working prototype ride-on sweeper. There were plenty of positive comments, some suggestions and many requests for demonstrations as soon as the testing allows. We really appreciated the feedback. RS Silacut. Again something new to look at. This brand new rotary cutter/bucket has been designed to cut clamp silage (maize and grass) and load it into a mixer for further processing. It leaves an extremely clean face to the clamp to prevent secondary fermentation and reduces waste. On farm trials are planned and there was a great deal of interest for both animal feeding and biogas plants.